- Abbott, A. O. Prison Life In The South At Richmond, Macon, Savannah, Charleston, Columbia, Charlotte, Raleigh, Goldsborough And Andersonsonville. New York: Harper And Brothers, 1865. Note: Abbott includes the date and place of capture in his listings. CT - Connecticut Prisoners of War Books, listed by year. 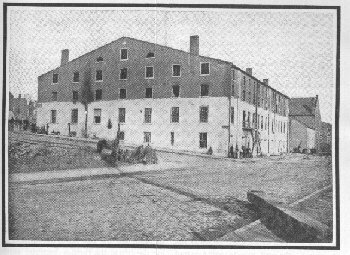 Photograph of Libby Prison, 1865 - Putnam, George Haven. "Prisoners of War: A Soldier's Narrative of Life at Libby and Danville Prisons." The Outlook March 25, 1911, p 697.